Having a good command of grammar is a valuable skill to possess, no matter what industry you work in. However, since so much of what is produced by law firms and courts is in the form of the written word, it is essential that anyone working in the law have highly refined grammar skills. With that in mind, we have some great grammar resources to share with you. Whether you are looking to improve your grammar, or are simply looking for a specific grammar rule, these websites will give you the information you’re looking for. They also have some cool features you may not have known were available. Jane Strauss, the author of The Blue Book of Grammar and Punctuation, wanted this website to serve individuals seeking to improve their punctuation and grammar skills. Although Jane passed away in 2011, her website survives as part of her legacy. The homepage displays links divided into categories: grammar rules, punctuation rules, and other rules. They also have free online quizzes available to non-subscribers as well as subscriber exclusive tests. If you would like to access the more detailed quizzes, you can also pay 99 cents for access. And should you find the website very helpful, you can opt to subscribe for $29.95, which offers 500 log-ins. Instructors and employers can subscribe for $99.95, which includes an unlimited amount of log-ins for one year. Instructors and employers have control over quizzes, and quiz results are automatically tallied. This website offers a tool that acts as an automated proofreader. In other words, it is an instant grammar checker. It checks your writing for spelling and grammar and punctuation mistakes. It also goes one step further and checks for plagiarism! Anyone can benefit from this website whether they are a student, paralegal, court reporter, writer, or simply an individual hoping to improve their writing skills. 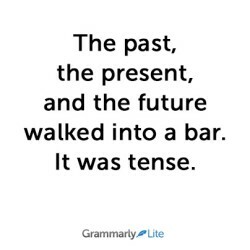 Grammarly also posts some great creative images and jokes on their blog and social media accounts (such as the image in this article). Lousywriter.com is a free online resource to help you improve your writing skills. As explained by their homepage, they abide by the English standard of writing because they want to “make you sound intelligent and make you look professional.” Their mission is to help you communicate more effectively through proper word usage and sentence structure. The website has many links, including video tutorials, audio podcasts, a grammar blog, free eBooks, and free visual charts. It also includes links to writing and editing jobs, freelance writing groups, English grammar books, and grammar software. And to make things easier, there are even cheat sheets on violations of English words, homonyms, homogeneous words, and possessive nouns – all subjects that people commonly struggle with. Furthermore, they also include links on how to write effective sales letters, resumes, ad copy, and blog copy. This website has a plethora of information and helpful tips that anybody will find applicable. This website was created by University of Northern Iowa’s Department of Languages and Literature to help writers in need of a reliable grammar and punctuation resource. Included are frequently asked questions that everybody wonders at least once in their lifetime. The answers are thorough and informative. DrGrammar.com also provides sections on word origins, English as a second language, plagiarism, business communication, documentation resources, a writer’s toolbox, as well as a section where readers can ask questions. Even if you were not born with good grammar genes, no one needs to know. Use these resources to pick up skills you are lacking, or simply to check specific instances of grammar you are questioning in your own writing. If you found this article interesting, you might also like “7 Good LinkedIn Groups For Paralegals”. This entry was posted on Wednesday, November 6th, 2013 at 4:40 pm	and is filed under All Posts. You can follow any responses to this entry through the RSS 2.0 feed. You can skip to the end and leave a response. Pinging is currently not allowed.